Haghgou Tabalvandani, M., Yadollahi, A., Atashkar, D., Eftekhari, M. (2014). Optimized Root Production During Micropropagation of New Iranian Apple Hybrid Rootstock (AZ X M9): Effects of Fe-EDDHA and Thiamine. International Journal of Advanced Biological and Biomedical Research, 2(10), 2659-2662. M. Haghgou Tabalvandani; A. Yadollahi; D. Atashkar; M. Eftekhari. "Optimized Root Production During Micropropagation of New Iranian Apple Hybrid Rootstock (AZ X M9): Effects of Fe-EDDHA and Thiamine". 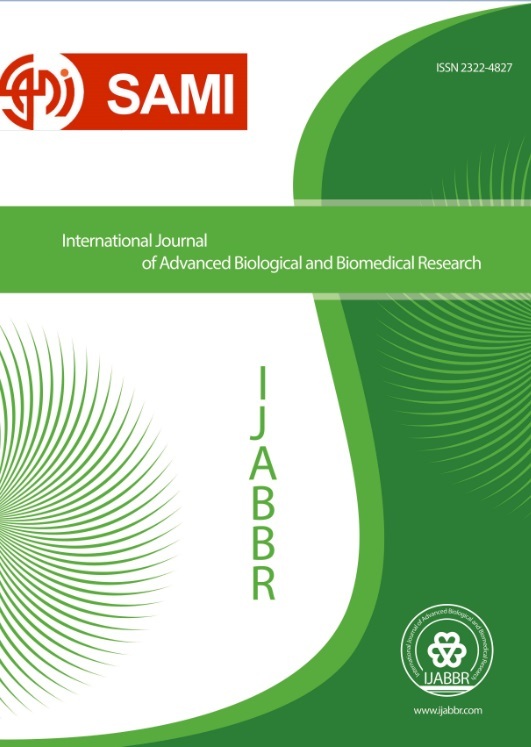 International Journal of Advanced Biological and Biomedical Research, 2, 10, 2014, 2659-2662. Haghgou Tabalvandani, M., Yadollahi, A., Atashkar, D., Eftekhari, M. (2014). 'Optimized Root Production During Micropropagation of New Iranian Apple Hybrid Rootstock (AZ X M9): Effects of Fe-EDDHA and Thiamine', International Journal of Advanced Biological and Biomedical Research, 2(10), pp. 2659-2662. Haghgou Tabalvandani, M., Yadollahi, A., Atashkar, D., Eftekhari, M. Optimized Root Production During Micropropagation of New Iranian Apple Hybrid Rootstock (AZ X M9): Effects of Fe-EDDHA and Thiamine. International Journal of Advanced Biological and Biomedical Research, 2014; 2(10): 2659-2662. Objective: In vitro propagation of AZ x M9 new apple rootstock resulted of breeding program of vegetative apple rootstock in Iran was investigated. Methods: Nodal explants were inoculated in Murashige and SKoog (MS) medium supplemented with various concentrations of 6-benzylaminon purine (BAP) (0.4, 0.8 and 1.2 mg/l) alone or with naphthalene acetic acid (NAA) (0.1 mg/l). We examined the effect of different concentrations of iron sequestrene (Fe-EDDHA) and thiamin vitamin in ½ MS and Linsmaier and Skoog (LS) media supplemented with indol-3-butric acid (IBA) (1 mg/l) on rooting of attained plantlets. Results: According to our results, 0.4 BAP + 0.1 NAA treatment in MS medium was the best component which resulted in the highest proliferation rate (6.73). As well, we estimated the highest root number in ½ MS + 0.15 g/l Fe-EDDHA + 2.4 g/l thiamin.